For the first time in over a month, our VCU Rams are on bounce back status. The black and gold are coming off their first loss since Dec 7, having dropped a close road game at Davidson Saturday afternoon. The last time Will Wade and Co. dropped one they followed it up with a road win and a big one at that, snapping a two-game losing streak in front of a sold out Ted against rival Old Dominion. On paper, tonight’s bounce back opportunity should present much less of a challenge. It’s been a tough go in Fordham’s second season under head coach Jeff Neubauer. After pulling off Fordham’s first winning season in nine years during his first campaign in the Bronx, Neubauer’s Rams are back to struggling, having dropped 10 of their last 12 contests including four home games. Fordham may however have their biggest challenge tonight when facing a VCU team that is the only squad Fordham will have played all year in the kenpom top-60. The reason for the Rams’ struggles? One of the worst offenses the A-10 has seen this past decade. At 66.5 points per game the Rams rank 312th nationally. Only one of this season’s Rams checks in with an offensive rating over 100 (VCU has eight). They shoot poorly both inside and outside of the arc and have been one of the worst offensive rebounding teams in the country. Defensively the Rams do one thing extremely well however: turn teams over. When Fordham isn’t giving up easy baskets they are turning teams over 27.3% of their possessions. That currently ranks second nationally and is at a level that matches the best havoc-wreaking teams VCU has ever had. But that is it. Fordham does one thing well and nothing else. With that you’ve seen the Rams drop games to the likes of Sacred Heart (312th nationally), Manhattan (253rd) and Duquesne (209th) while being blown out by 15 points or more five times already. Offensively Fordham lives and dies by the three. 43.3% of Fordham’s shots become from beyond the arc, an insane number for almost any team but especially for one connecting on just 32.2% of their attempts. 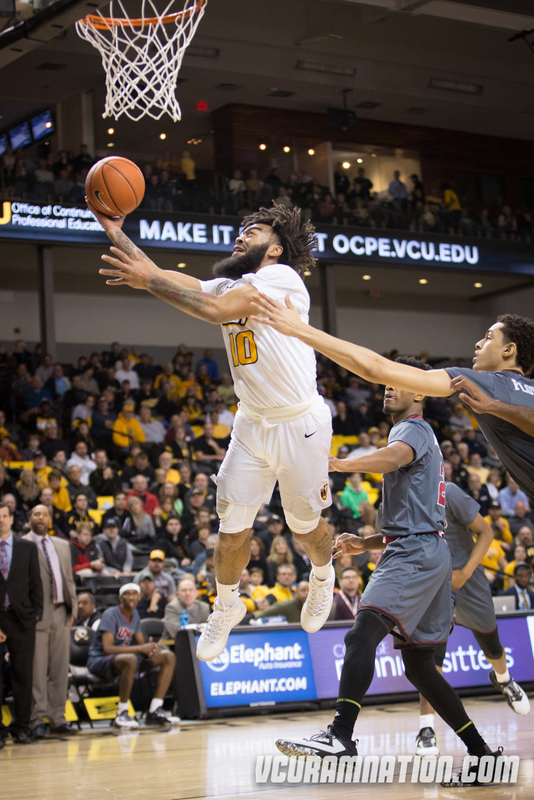 After cruising to an eight-game winning streak including four straight A-10 wins to open conference play, VCU hit a wall against Davidson, scoring just 63 points against the Wildcats. It was VCU’s lowest total since a historically bad 46-point performance against Illinois and tied the 63 points scored against Baylor earlier this year, matching VCU’s second worst offensive night of the season. Many Ram fans would chalk that up to poor officiating, but the Rams’ 3-17 (17.6%) night from three and 41.7% night inside the arc speak volumes as well (shoot just 35% from three and we win, shoot a poor 29% and we got to overtime). Mo Alie-Cox was held to 11 points on 5-11 shooting and added three turnovers and four fouls to earn an 84 offensive rating. It was his lowest rating since VCU’s three-point road in at ODU (83). He posted two sub-90 ratings in the previous two games, both losses (83 versus GT, 88 versus Illinois). I challenge you number junkies out there to keep an eye on that number the rest of the season and see how VCU does on those nights (Mo’s season rating is currently 112). Regardless, Davidson has two incredibly skilled players that had an amazing night, which, combined with a little defense, resulted in a conference road loss for VCU. Those happen and aren’t out of the ordinary against top-100 teams with future Hall of Fame coaches like Davidson and Bob McKillop. But tonight are the games good teams can’t drop. The Rams had two letdown road games at UMass and Mason last season. Both however, were at least top-200 teams. VCU hasn’t lost a sub-200 game since falling at James Madison on Feb 13 of 2010 (Shaka Smart’s first season). Can’t have that streak end tonight. Sounds weird to say this about VCU versus anyone, but if the Rams can keep the turnover battle close, they should win. Fordham leads the A-10 with a +6.17 turnover margin, about a four-turnover advantage of VCU’s margin thus far. Fordham however helps erase that stat with a -8.9 rebound margin (VCU is +2.3). Basically if you look at the numbers the Rams SHOULD both finish their shots and defend Fordham’s better than tonight’s host, meaning if VCU can avoid some freak margin in the turnover or rebound battle, the Rams should return to Richmond victorious. Statistically Fordham just has so much going against the in this one that I think the only way they pull out a win is to pull out a freak night from three-point land. The Fordham Rams are attempting about 25 threes per game, so you get those things falling and strange things happen. Fordham’s will also need to contain VCU inside the arc. Jeff Neubauer’s squad has been one of the 26 worst teams in the country in two-point defense. That is TERRIBLE news for Fordham when facing a VCU team that gets 46.5% of their shots at the rim. Kenpom: 70-61 VCU win with a 78% chance of a Rams victory. Watch: CBS MASN, Official game day headquarters are Baja Bean Co. in the Fan and Buffalo Wild Wings locations at Virginia Center and downtown on Cary Street in Shockoe Bottom.